ca. 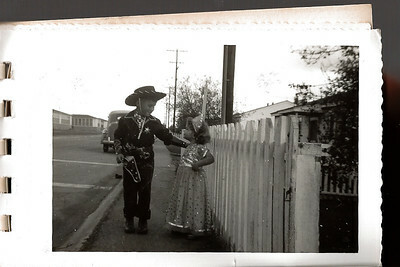 1952, Ellis Mirsky and Phyllis Jayne Mirsky in front of 27 Ulrich Street, San Diego, CA, dressed in our Purim costumes. Phyllis as Queen Esther and Ellis as King Achasvaros, King of the Cowboys. 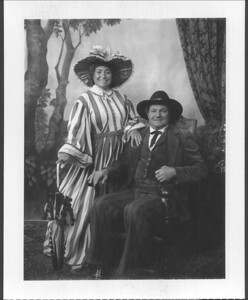 Evelyn Hirsch nee Mirsky and Mike Mogul, dressed up in old western costumes, ca. 1990. Ellis Mirsky ca. 1950 with what looks like bubbles, sitting on the fender of what could be his father's then relatively new 1950 International pickup truck on the street at what might be Ward Avenue in the Bronx where grandparents Leon and Mary Mirsky lived. Ellis Mirsky (age 4 approx.) 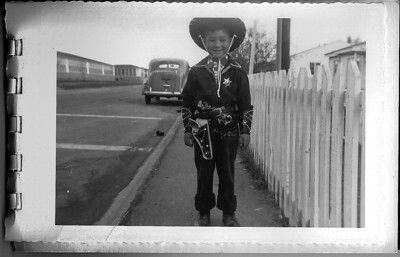 in front of 27 Ulrich Street, San Diego, CA, dressed in his Purim costume as King Achasvaros, King of the Cowboys. Back Story: I received the cowboy gear and loved it. I would wear it whenever possible. Purim arrived and it was time to don a suitable middle eastern Purim costume. I refused. 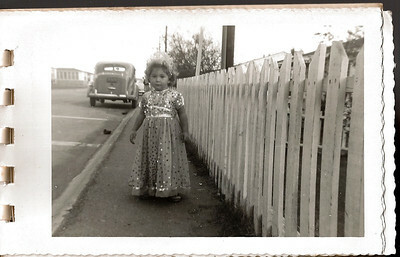 After all, my sister Phyllis was dressed like a princess - Queen Esther. 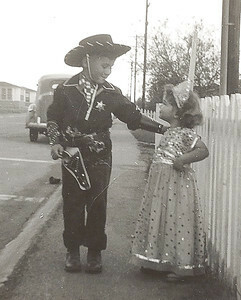 I insisted on wearing my Roy Rogers, King of the Cowboys outfit. It was a tough negotiation, but I prevailed, albeit with a touch of compromise. I convinced my parents to allow me to wear the cowboy outfit as long as I told everyone that I was King Achasvaros, King of the Cowboys. 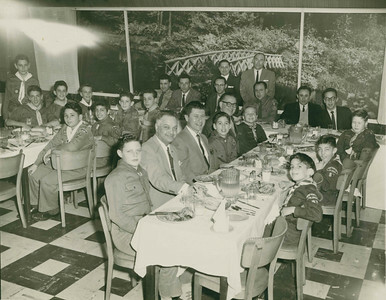 Photo taken at Bar Mitzvah celebration of Ellis Mirsky at 2448 Wilson Avenue, Bronx, NY, ca. November 1960. Indeed that would be Ellis Mirsky at about 6 months (?) 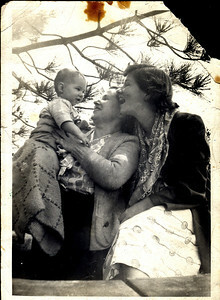 being held by grandma Shirley under the approving eyes of mother Lucille Mirsky, 1948. 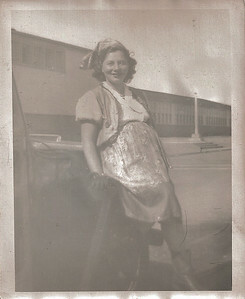 Lucille Mirsky leaning on what looks like a Jeep parked in front of her home on Ulrich Street, San Diego, CA ca 1949 (pregnant with Phyllis Jane). Or ca.1947 pregnant with Ellis Richard. 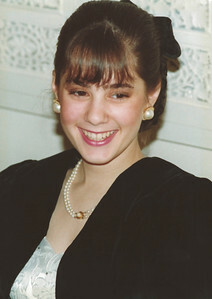 Photos taken at 2448 Wilson Avenue, Bronx, NY, at my (Ellis Mirsky) Bar Mitzvah reception. 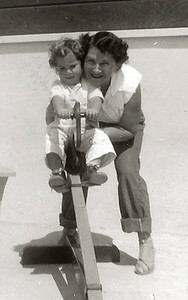 Left: Al and Tessie Cohen, Gizzie (Gisela) Simon (Paula's, Mark's, Jan's and Felicia's grandmother), Phyllis Simon nee Mirsky. 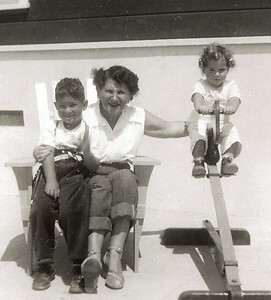 Right: Phyllis Simon nee Mirsky, Shirley Albert (grandmother), unknown man, Lucille Mirsky, Zoltan Simon. Note the paneled wall and hand-crafted cabinets made by Joe Mirsky. 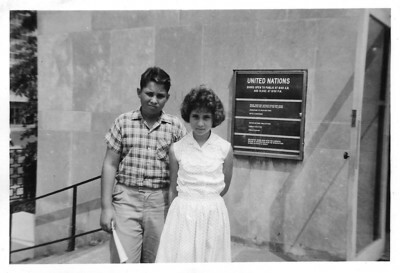 Ellis Mirsky and Phyllis Jayne Simon (nee Mirsky) at the U.N. in New York City having a wonderful time (with Grandma Shirley) ca. 1959. 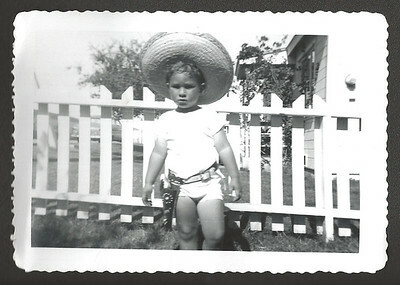 Ellis Mirsky (3 yrs old), November 1950, Ulrich Street, San Diego, California. Six-gun shooter at the hip and straw Mariachi hat. 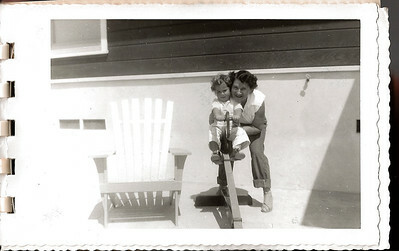 Grandma Shirley Jacobs (Lucille Albert Mirsky's and Phyllis Weiss Jacobs' mother) with Phyllis Jayne Mirsky in San Diego, California, ca. 1951.
ca. 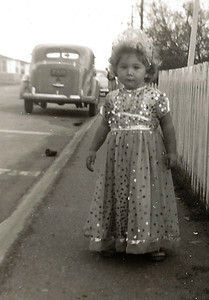 1952, Phyllis Jayne Mirsky in front of 27 Ulrich Street, San Diego, CA, dressed in her Purim costume as Queen Esther. ca. 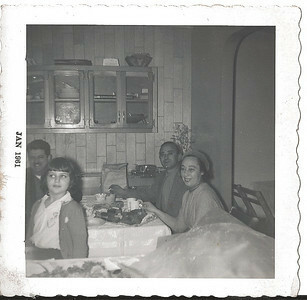 1951, Grandma Shirley Jacobs (Lucille Albert Mirsky's mother) with Ellis Mirsky and Phyllis Jayne Mirsky. Note the ever-present holster and six-shooter. And note the cludgy high top leather shoes to guard against ankle twists. And, of course, helmets for bouncy ride on toys like the one shown were not even given a second thought. Better hold on tight. 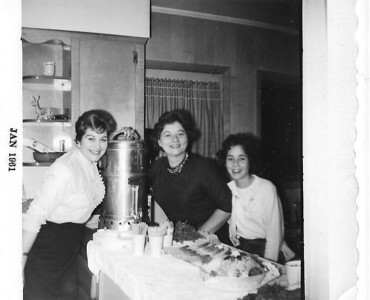 Ellis Mirsky, grandmother Shirley Jacobs, Phyllis Jayne Mirsky. Note the ever-present six-gun shooter on Ellis' hip. Never know when some hombre might need some dance lessons. And see the cludgy high-top leather shoes to support the ankles. ca. 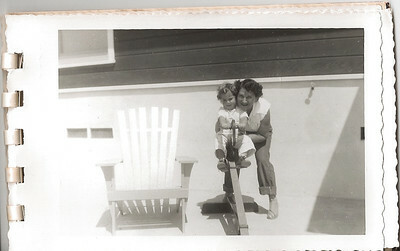 1951, Grandma Shirley Jacobs (Lucille Albert Mirsky's mother) with Phyllis Jayne Mirsky. Helmets for bouncy ride on toys like the one shown were not even given a second thought. Better hold on tight. Ellis Mirsky and Phyllis Jayne Mirsky in front of 27 Ulrich Street, San Diego, CA, dressed in our Purim costumes. Phyllis as Queen Esther and Ellis as King Achasvaros, King of the Cowboys. 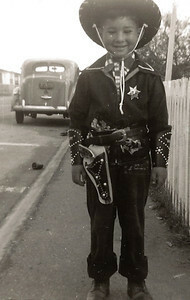 Ellis Mirsky in front of 27 Ulrich Street, San Diego, CA, dressed in his Purim costume as King Achasvaros, King of the Cowboys. 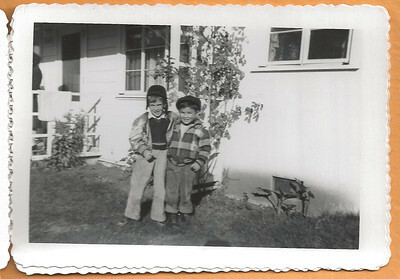 Two boys on lawn on Ulrich Street, San Diego, CA ca Dec. 1950. 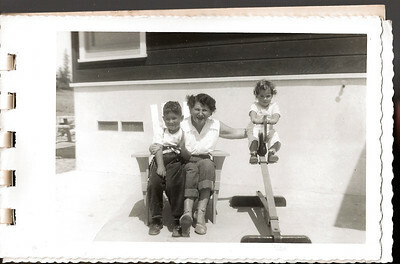 Shorter boy on the right may be 3 year old Ellis Mirsky, born 11/22/47. Very big.